Since making its debut in 2006, Newfoundland’s Hey Rosetta has been racking up an impressive list of awards in the indie rock world and refining its sound along the way. In the studio the band’s basic quartet (Tim Baker, vocals, guitar, piano; Adam Hogan, lead guitar; Phil Maloney, drums; Josh Ward, bass, backing vocals) is supplemented by a string section of Kinley Dowling on violin and Romesh Thavanathan on cello, and the resulting sound is a hybrid rock and world music mélange that can be quite intriguing in service to one of Baker’s well-crafted songs and expressive, blues-tinged singing. 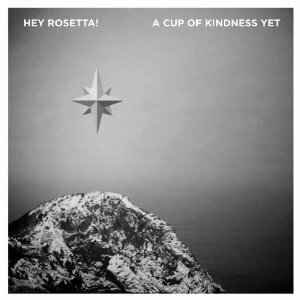 A Cup of Kindess is the band’s holiday treat for 2012, a four-song EP of striking original seasonal missives rather than traditional carols (save “O Come O Come Emmanuel,” which in this band’s hands rises from a deeply interior, eerily quiet opening into a howling, fuzzed out attack before Baker's subdued re-entrance, although something has changed--the ramshackle drums suggest a psychological dislocation you begin to hear in the cracks in Baker’s voice as the song winds down--his belting of “Rejoice! Rejoice! Rejoice, Emmanuel” sounds more like a desperate plea than an exaltation. The exotic flavor of “Carry Me Home” sounds like it might have been inspired by Paul Simon’s Graceland, and in fact Baker’s vocal phrasing and timbre has a lot in common with the younger Paul’s wry delivery; even his lyrics tend to a Simon-like awareness of metaphysical forces that can be petitioned to aid him in his hour of need (angels to help him get back to where he once belonged, as he pleads in “Carry Me Home,” with church bells pealing and voices in unison behind him). Despite its title, “The First Snow,” with its scratchy vinyl record backdrop, funereal pace and mournful strings, exults not in a happy seasonal event but instead is a big chill report on what seems like a love affair’s painful demise, an abiding ache expressed in Baker’s halting vocal and curious way of singing “the first snow” in a way that suggests he doesn’t believe what’s happened to him. If “Carry Me Home” is about finding one’s way back to something precious, “New Year Song,” the final track on the EP, is the opposite--a good riddance to a bad year--made all the more poignant by the strains of “Auld Lang Syne” the band interpolates with increasing intensity starting midway through this five-and-a-half minute treatise. Careful listeners will note how Baker uses snow as a leitmotif in the EP’s songs, symbolizing emotional stasis, or lassitude, as opposed to purity and/or beauty. It would be nice if this journey had continued, and certain themes developed further. But this is it: A Cup of Kindness is a mere snapshot of a season fraught with unsettled issues, which, Lord knows, have a tendency to surface with a neon glow during the holidays. The press release announcing this as “definitely not your average Christmas album” could not have been more on the money. But even if it isn’t merry and bright, A Cup of Kindness never fails to be intriguing, as it underscores the fact of Tim Baker’s vision being ever compelling and of him being one of the most literate young songwriters around.